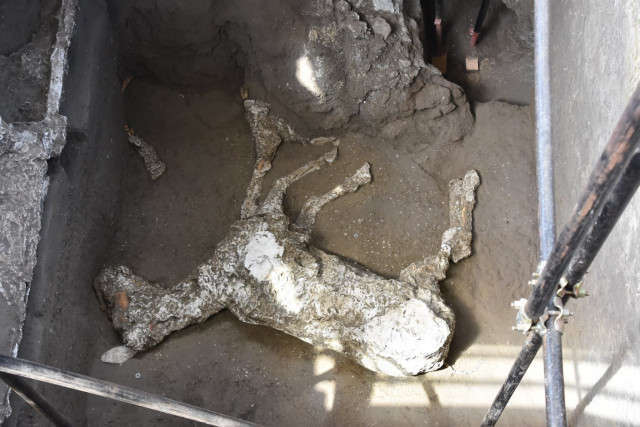 For the very first time, archaeologists have discovered the remains of an ancient horse cast in the volcanic ash of Mount Vesuvius in Pompeii. The discovery, described by Pompeii site director Massimo Osanna as "extraordinary", was made on May 10, in a long-lost tomb in the Civita Giuliana area, north of the walls of the archaeological site of Pompeii. Alongside the tomb, archaeologists stumbled across an exceptionally well-preserved suburban villa containing a bunch of artifacts, such as a wooden bed, wine amphorae, and other kitchen utensils. They even discovered the grave of a man buried after the fatal eruption, suggesting people continued to live around the ruins of the town even after the catastrophe. Pompeii, of course, is the world-famous Roman town that was decimated by the eruption of Mount Vesuvius in 79 CE. At least 10,000 perished in a downpour of volcanic ash and pumice from the volcano, making it one of the deadliest eruptions in human history. Thousands of years on, Pompeii has become the longest continually excavated archaeological site in the world. Its ruins have been loosely explored for 500 years, but it wasn’t until the 19th century that archaeologists truly broke ground and discovered the scale of the lost city. In 1860, Italian archaeologist Giuseppe Fiorelli discovered that you could trace the lost bodies of people by pouring cement into the hollows formed in the volcanic ash where the bodies had disintegrated. This produced a perfect cast of the body in its dying moments. This technique has been used to find the bodies of around 1,500 people. Among them are castings of families huddling together, two people embracing as they died, and even a guy who appears to be masturbating (according to Twitter, at least). Over the past summer, Pompeii had fallen victim to tomb raiders and grave robbers who dug tunnels to search for valuable artifacts from the villa. Although it is unclear how much they managed to steal, the exploits were enough for the local authorities to start their own dig to preserve the archaeological heritage of the Roman town. Other animals have been discovered at Pompeii using this casting technique, including dogs. 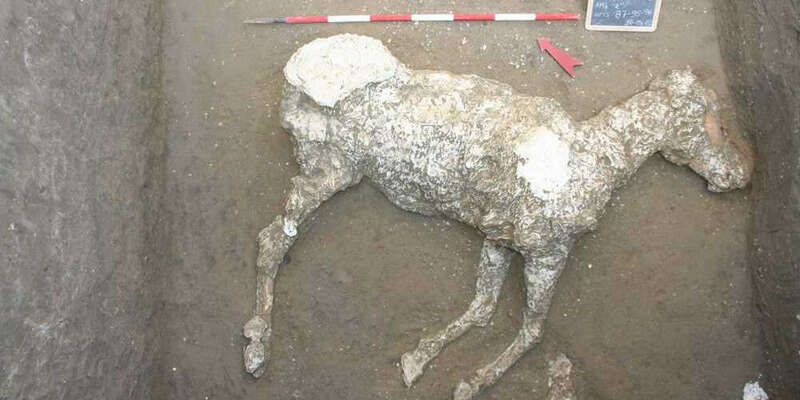 However, this is the first ever unearthed horse. The horse is said to be exceptionally large and strong for a horse from Ancient Rome, leading researchers to believe it was a thoroughbred either used for racing or war. The owner, therefore, was probably exceptionally wealthy too. You can watch part of the incredible excavation process in the video below.